The greatest ever Aberdeen player. 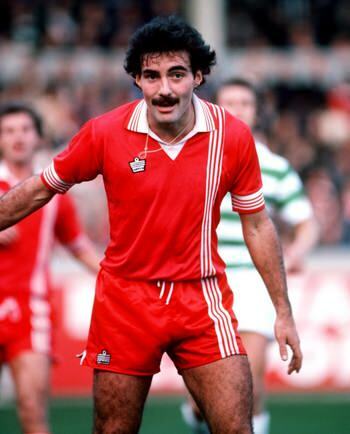 Willie Miller spent his entire career at Aberdeen, playing a record 797 games in all competitions. A fantastic leader and rock solid defender, Miller captained Aberdeen to the 1983 European Cup Winners Cup trophy, beating Bayern Munich and Real Madrid along the way. Despite his reputation as a tough defender, he was gifted with great passing abilities, especially long balls out of defence, one great example being his assist in the 1986 Scottish Cup final, setting up John Hewitt's first goal with a 60 yard pass. He was also excellent in the air despite not being particularly tall for a defender. Maybe his greatest trait was his ability to make everyone around him play better: he formed a great partnership with Alex McLeish at Aberdeen and in the Scotland national team, and was also renowned as an inspirational leader on the pitch, setting a great example for his teammates. Amongst the many plaudits given to him, Alex Ferguson called him "the best penalty box defender in the world" during his time as Aberdeen manager, and Bayern and Germany legend Karl-Heinz Rummenigge described him as the best defender he had ever faced after Miller kept him quiet over both legs in the 1983 ECWC: high praise from a man that had faced the likes of Gaetano Scirea and Claudio Gentile in the World Cup final only a year beforehand. Nowadays Miller holds a contentious place in the hearts of Aberdeen fans: he is still widely regarded as the greatest player in the club's history, but his time working for the club since his retirement has come under intense fan scrutiny. Regardless, he will always hold a place in Scottish football history, as one of the greatest defenders the country has ever produced. Last edited by StuartBannigan on Wed Mar 27, 2019 2:28 am, edited 1 time in total.